Greater London is an administrative district. It covers London, England. About 7.5 million people live there. 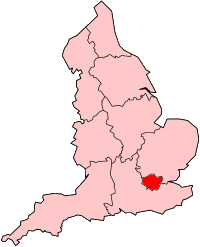 It is also one of the regions of England used by the Government for various purposes, including administration and statistics. Greater London is a conurbation, a city made from merging many smaller villages, towns and cities into a larger one. "London" is technically only the City of London, one of London's 33 administrative districts. In order to avoid confusion, "Greater London" is often used to mean the whole modern urban area centred on the City of London, and not just the City of London itself. When most people say London, they are referring to Greater London.